5th Annual Love Bike Ride! Wheeee! Seriously, this ride is called the Love ride! 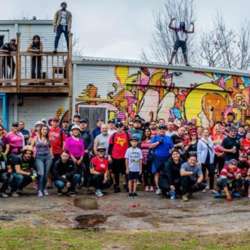 Let’s explore Houston with a social bike ride through Htown with 4 stops at local graffitis, murals, & public arts....featuring LOVE. Protected content social paced rides. Taco trucks & cool drinks along the way. The group will meet at the bar at 12:30PM and will roll out at 1PM. Expect Protected content due to stops for taking pictures. Friends, Water, sunscreen, camera, CASH, spare tube & bike tools. If you don’t have a bike, then you can rent at BCycles ( Protected content ) or borrow one from a friend.